As newspaper reports, Elke Batista, erstwhile the shooting star of Brazilian economy and one of the richest man in the world, filed for bankruptcy protection on 30th October 2013. His entrepreneur's career includes gold, silver and iron mines and companies that are involved with mining, petroleum, energy and logistic. According to different business magazines, his rise to the Forbes List of richest billionaires in the world started actually with the premature stock market lunching of his companies, and he profited from positive prognosis for Brazil's economical growth and from the policy of the world's central banks that pump huge amounts of money into economy. In the beginning of 2012 Elke Batista was still on the Forbes List, but his wealth and fortune started to crumble heading towards the low point from July 2013 onwards. Although some sources give the 3rd and the others the 5th November 1953 as the birth date, and although the birth time is not available, what leaves much of the information ( angles, houses and exact Moon position) out of consideration, one look at the Solar Arc and transit picture is very revealing. It tells also something about natal chart career factors. 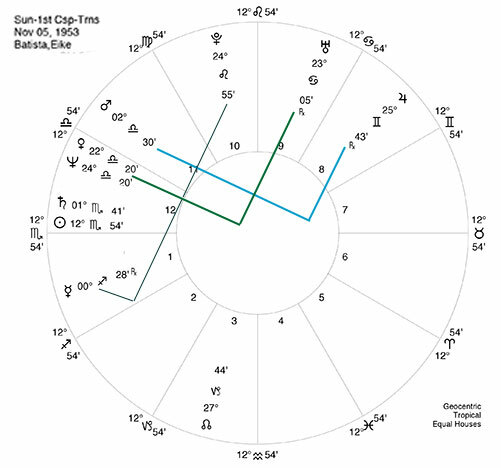 Astrological measurements that lead to bankruptcy started to build in 2009 when Solar Arc Pluto activated the natal square of Uranus to Neptune - Venus conjunction, which is obviously important configuration for Elke Batista's career. Pluto arced to Venus in 2009. Pluto's arc to Uranus was exact in June 2011 and arc to Neptune in June 2012. The Venus-Neptune-Uranus combination suggests in financial terms investment, speculation and foreign funds . In the horoscopes of entrepreneurs , Pluto can dramatically manifest as the planet of debt and bankruptcy. In the time between 2009 and 2011 when Pluto crossed this constellation, investments and foreign funds (and the debt) accumulated in extra big amounts, while the value of his projects underwent change: with Solar Arc Pluto = Venus in 2009 Batista reached the 61th position in Forbes List and was considered the richest man in Brazil. With the Solar Arc Pluto = Uranus in 2011, what suggests further expansion, he reached #8 on the Forbes List and was introduced as one of the 50 most influential people in global finance in "Bloomberg Markets" magazine. When Solar Arc Pluto reached Neptune in July 2012 the value of his stocks drastically dropped and his wealth began to crumble. Elke Batista's natal chart shows Mars square Jupiter , a measurement that can be very supportive for speculations, risks and making quick money, but that can also bring misjudgment due to overestimation. This is an aspect of a fortune soldier, which seems to apply here. Forbes.com writes "Batista became nothing but a constant juggler. And not a very good one. He became, as the old adage says, a jack of all trades and a master of none." This adventurous square makes a sextile to Mercury. The Mercury is retrograde and that can moderate a bit the overly enthusiastic Mars - Jupiter connection. But, that Mercury was receiving a square from transiting Neptune for approximately two years - from April 2011 to December 2012. Under Neptune's transit to Mercury the judgment is not clear, especially so when it comes to persons who hold their beliefs primary in terms of their successful practical application. Starting from conjunction to Mars in 2009, transiting Saturn crossed Venus, Uranus and Neptune from 2011 to 2012 and prepared the grounds for second Saturn return at the end of 2012. Saturn return always represents some kind of lease for the future, and here that lease is overloaded with debt. In August 2013 the Solar Arc Saturn has reached the square to natal Mars, testing further Batista’s speculative businesses. Next station of the transiting Saturn was conjunction to the Sun, what marks a professional climax for better and worse. It is this Saturnian pressure under which Elke Batista has filed for bankruptcy protection at the end of October 2013. Pertaining to the future developments, there is the Solar Arc of Neptune reaching the natal Jupiter in the mid of 2014 which suggests legal procedures and self-indulgent overconfidence: in his first interview after the bankruptcy Elke Batista found his managers guilty for the collapse of his empire. The whole picture suggests that this Neptune - Jupiter contact will bring further dissolution of his wealth. Weather 2015 with Solar Arc Uranus to Sun and Jupiter in 2015 will open long-term possibilities for Batista depends on his attitude and actions in the next year. Anyhow, the time beyond 2015 will continue to be exciting for him because Uranus will cross the same Uranus-Venus-Neptune configuration that was jolted by Pluto in last years.